Don’t Miss the Chincoteague Shore Craft Beer Festival! The 2nd annual Chincoteague Shore Craft Beer Festival is coming! Food trucks, live music, and 12 breweries offering samples of over 30 beers will take over Chincoteague Island Fairgrounds for an afternoon of fun. Saturday, April 28th, 2018. Q: What do you get when you mix craft beer, local food trucks, and live music with the Chincoteague Island Fairgrounds? A: A GREAT time for all! If you agree with the answer above, then the annual Chincoteague Shore Craft Beer Fest is the spring event for you! 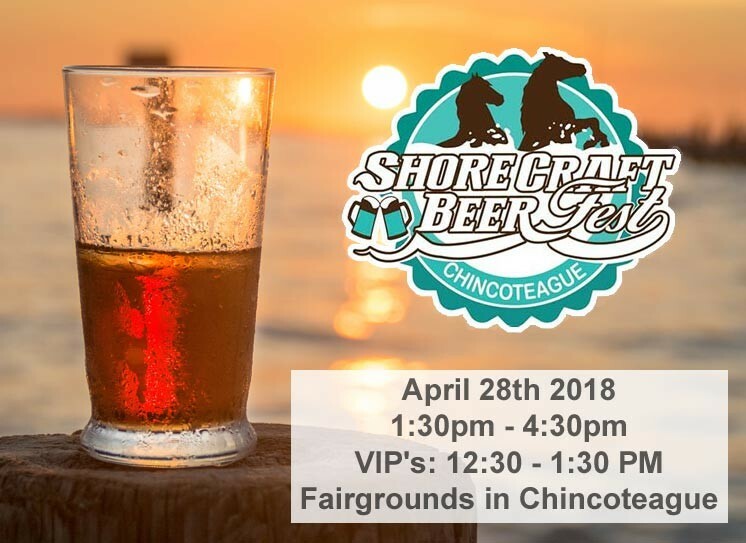 You’ll enjoy unlimited craft beer tastings from local, Eastern Shore breweries and also have the opportunity chat with the brewery reps.
Posted in Chincoteague Events & Activities | Comments Off on Don’t Miss the Chincoteague Shore Craft Beer Festival!